How many of us are dishonest with ourselves about our healthy living habits? I know I am. And I am going to hazard a guess that many of you are too. It is not that I don’t have faith in you – it is simply human nature. I am sure that most of us consider ourselves to be honest people. We make an effort to be truthful with friends and family, and consider honesty to be an attractive quality. But we also want to be socially desirable. We want to be able to present ourselves in the best possible light. And to help us do that, we like to create a favorable impression of ourselves with… ourselves. Yes, you read that right. If we can convince ourselves that we are wonderful, it is easier to convince other people. That is human nature. By being truly honest with yourself you will be able to identify your weaknesses. Once you have identified your weaknesses you can start to take steps to improve or eliminate them. However, if you are dishonest with yourself, you will remain in denial about your flaws, making it impossible to become better. Honesty paves the way for change. If you cannot honestly and accurately assess where you are now, how can you make improvements? Self-honesty opens the door to self-reflection. Being honest about your weaknesses and your strengths will give you insight into the type of person you are. What works for YOU? What motivates YOU? This will help you work out what strategies are best for you to make the changes you are seeking. When it comes to nutrition and wellbeing, there is no ‘one size fits all’. For some people, an all-or-nothing approach works. For others, taking baby steps is a better strategy. Some people love to count calories. Others find it makes them obsessive. By being honest with yourself, you will be able to find the right path for you to rectify your weaknesses. It takes courage to be truly honest with yourself. The courage fostered by being honest with yourself will translate into courage to help you take the next step in your journey of change. You need to accept where you are now before you can make the decision to move forward. Greater self-acceptance can also lead to greater kindness towards yourself. 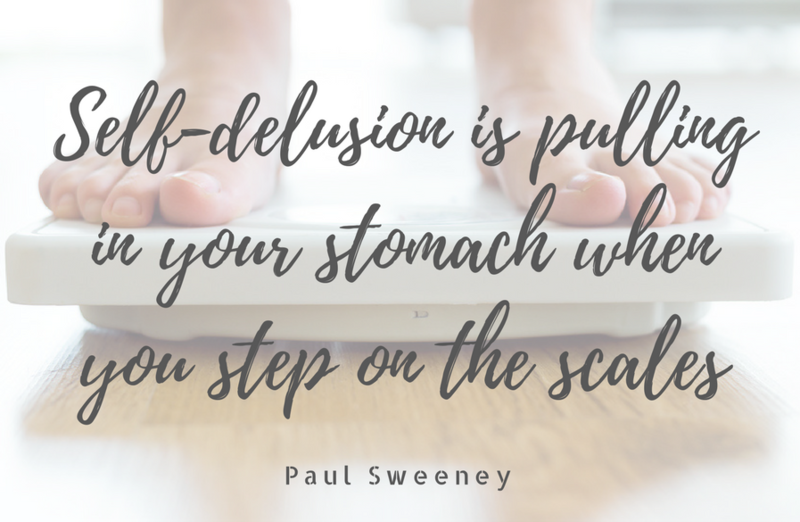 When it comes to food and health, so many of us are harsh on ourselves. We have a constant dialogue of guilt, shame, and hatred going on in our heads. But self-honesty can help you accept where you are, eliminating some of those damaging thoughts. Honesty leads to a sense of freedom and can boost your self-esteem. It can be exhilarating to truly accept the way you are. That excitement can motivate you to find one or two small changes to start working on. So how can you go about being honest with yourself? It is not easy, but here are some tactics to get you started. How much food do I really eat every day? How many nights each week do I really eat ice cream? How many times a week do I actually exercise? Keep a food or exercise diary for a few days. Make sure it is accurate. Write it ALL down… including that half fish stick you ate from your child’s discarded dinner plate (umm that’s me). Then look at it. You might be surprised by what you see. Really think about your motivations. If you eat ice cream every night before bed, ask yourself why. Is it habit? Is it because you do not eat enough dinner? Is it because you have a sugar craving? It takes time to learn how to be truly honest with yourself. Think of it as a work in progress. Sometimes it helps to embark on this journey with someone. That could be a weight loss buddy, a dietitian, or even a therapist depending on what your issues are. Above all, be kind to yourself, take it slowly, and don’t give up. And if you have any questions, please feel free to post them in the comments. Thank you for this post – it is always interesting when you offer a wider view of nutrition like this. Please do more – and I mean that honestly!